Saturday, June 2, is Free Fishing Day in New Mexico , the perfect time to take the family to one of the state's many fishing waters. No license is needed, although all other rules apply on this special day intended to encourage everyone to take advantage of one of New Mexico 's finest recreational opportunities. This year, the Department of Game and Fish is celebrating Free Fishing Day by conducting 11 free fishing clinics around the state. Anglers of all ages are encouraged to participate in the clinics. All you need are some basic fishing equipment and a desire to fish in New Mexico 's great outdoors. Most clinics will offer prizes for children who register and attend educational stations. More than 100 volunteers and 25 Department staff members will be at the clinics to provide fishing instruction and information about New Mexico 's fish and fish habitat. Young anglers will learn the basics: how to bait hooks, tie knots, catch fish and the correct way to release fish. They'll also learn how to be responsible anglers and how to get the most out of the Department's Fishing Rules and Information Booklet. 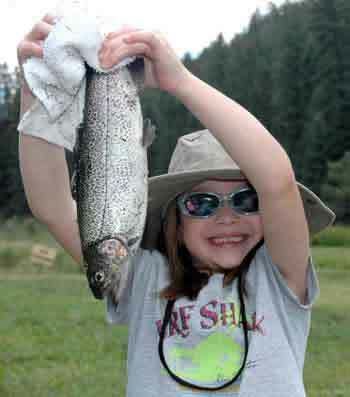 The fishing clinics will be at waters across the state in lakes and streams of varying sizes. Almost all of them will be generously stocked with catchable-sized trout or channel catfish before the events. Questa: Eagle Rock Lake , 8 a.m. to noon. Cowles: Cowles Pond, 10 a.m. to 2 p.m.
Ruidoso: Grindstone Reservoir, 8 a.m. to noon. Roswell : Wal-Mart Supercenter parking lot, 8 a.m. to noon. Corona : Corona Pond, 8 a.m. to noon. Santa Rosa : Blue Hole Park kids pond, 8 a.m. to noon. Quemado: Quemado Lake , 9 a.m. to 2 p.m.
Las Cruces : Alumni Pond, New Mexico State University , 8 a.m. to noon. Albuquerque : Tingley Beach, 8 a.m. to noon. Grants: Grants Pond/Riverwalk Front, 8 a.m. to noon. Glenwood: Glenwood Pond, 8 a.m. to noon. For more information about Free Fishing Day and the fishing clinics, please call Kevin Holladay at (505) 476-8095, or visit www.wildlife.state.nm.us . Spring and early summer is the time of year when wildlife give birth to their young. It also is a time when people must remind themselves not to touch or approach young wildlife. 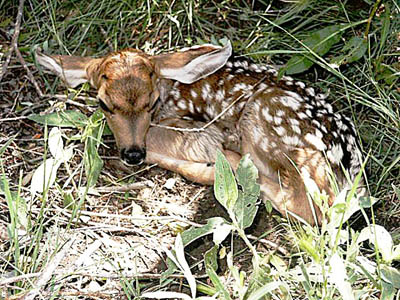 "That deer fawn, elk calf or baby bird may seem to be lost or abandoned," but it is not," says Darrel Weybright, big-game program coordinator for the Department of Game and Fish. "It is natural for young animals to be left alone so their mothers can feed, and to protect them from predators. If you find one, it's always best to just admire it from a distance and quietly move on." Every year, the Department receives calls from people who find young wild animals and take them home or to an animal clinic believing they are helping. Actually, that is the worst thing they can do, Weybright said. Young wildlife rarely survives when removed from its natural habitat, and close encounters with humans and their pets can be fatal. Young animals can become stressed and not recover. Too much contact with human and pet scents also may prompt the mother to abandon her young, he said. In New Mexico , early June is the peak time when deer and elk have their fawns and calves. Weybright said this year's good spring moisture will help young animals survive by providing plenty of foliage where they can hide. "It's exactly what mama wants -- somewhere safe to put the young one while she goes off looking for something to eat." "It's important that people also understand that not all young wildlife survives," Weybright said. "Mortality is natural. The best way we can help them is to leave them be."